ROME – The security and migration decree proposed by Interior Minister Matteo Salvini was approved in the Lower House on Wednesday morning, despite protests from a number of Five Star Movement deputies, political sources report. “I’m happy, it’s a memorable day,” Salvini told reporters following the bill’s approval, which was supported by 396 members of the Lower House. 14 M5S deputies refused to vote in favour of the bill, while four members of Salvini’s own party also abstained. “I didn’t take part in the vote, rather than vote against it, as a sign of respect for the work people put in to improve the bill,” M5S deputy Doriana Sarli was quoted as saying. “No improvements were made to reduce the impact of the Security Decree on the social fabric,” Sarli added. 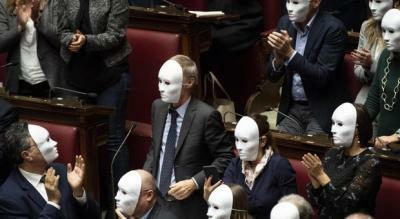 Democratic Party members of the Lower House demonstrated their disapproval of the bill by wearing white masks as the vote was taking place, representing the “invisible people” they claim will be created by this decree. “Those people will continue to exist but for you, they are invisible, nameless and faceless,” Graziano Delrio, the leader of the group, said in his speech to the House. The legislation will make it easier for authorities to deport asylum seekers found guilty of felonies.